Traveling south from Hartford on #91 get off in New Haven on the State Street Exit (#4) turn left on Humphry Street, next right onto East Street, at end of park turn right follow around to Wallace Street Teamsters on right. Traveling south on #95 cross the Q-Bridge (cement silos on the left), immediately after crossing exit to route 91 north, hug the exit very tight and exit onto Hamilton Street exit 2, bottom of ramp turn left, at next light Grand Ave. Turn right then left onto Wallace Street, Teamsters on the left. Traveling north on #95 exit Long Wharf / Sargent Drive Exit #46, turn left at bottom of ramp, turns into East Street under highway, travel (5) lights to Grand Ave, turn left then right onto Wallace Street. 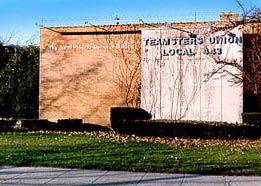 Teamsters Local 443 is on the left.